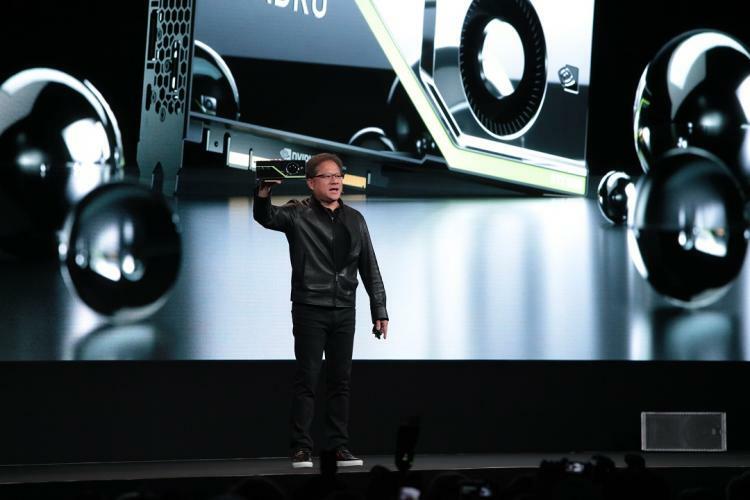 At SIGGRAPH 2018, NVIDIA CEO Jensen Huang presents the first batch of Turing-based graphics cards – the NVIDIA Quadro RTX 8000, Quadro RTX 6000 and Quadro RTX 5000. These are the next-generation NVIDIA Quadro graphics for professional applications that brings AI, simulation and advanced shading to creative professionals. The new NVIDIA Quadro RTX graphics cards are designed for the most demanding visual computing workloads such as those into scientific visualizations; automotive and architectural designs; and video and film content creation. The new RT Cores enables real-time ray tracing of objects and environments with physically accurate shadows, reflections, refractions and global illumination. Turing Tensor Cores to accelerate deep neural network training and inference, which are critical to powering AI-enhanced rendering, products, and services. The new Turing-based GPUs also feature the first implementation of ultra-fast Samsung 16Gb GDDR6 memory to support more complex designs, massive architectural datasets, 8K movie content and more. The NVIDIA Quadro RTX GPUs also support NVIDIA NVLink to combine to GPUs with a high-speed link to scale memory capacity up to 96GB and drive higher performance with up to 100GB/s of data transfer. The NVIDIA Quadro RTX GPUs also support USB Type-C and VirtualLink for display and next-generation VR headsets through the USB-C connector. Lastly, the Quadro RTX Series features new and enhanced technologies to improve the performance of VR applications, including Variable Rate Shading, Multi-View Rendering, and VRWorks Audio. Learn more about the Turing architecture here. Learn more about the NVIDIA Quadro RTX GPUs here.